Weighing in at only 3.5 ounces, newborn kittens are a precious handful. They are one of nature’s most vulnerable creations. 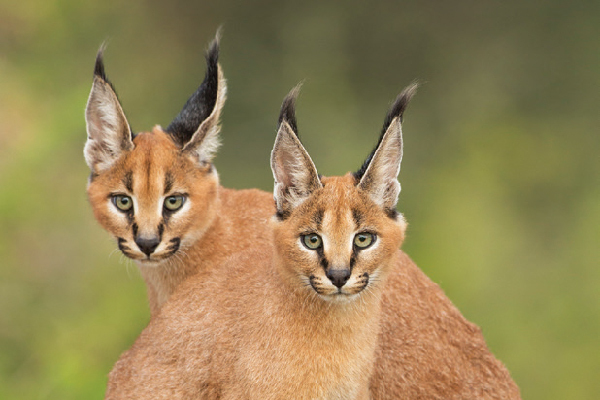 Cats reach sexual maturity at 6 months old and have a gestation period of 58 to 72 days. Unspayed females can have three litters per year. While spaying and neutering owned and free-roaming cats is more prevalent than ever before, there are still a lot of kittens out there. And many of them will need human intervention to survive. So, learning about newborn kitten care helps to save lives. Knowing the proper protocol for bottle feeding kittens and what to feed them is newborn kitten care 101. Let’s dive in! Newborn kittens are born completely defenseless. Photography ©Nada_Babic | iStock / Getty Images Plus. Kittens are born completely defenseless. Their eyes and ears are shut, and they are unable to even crawl. But they develop quickly. 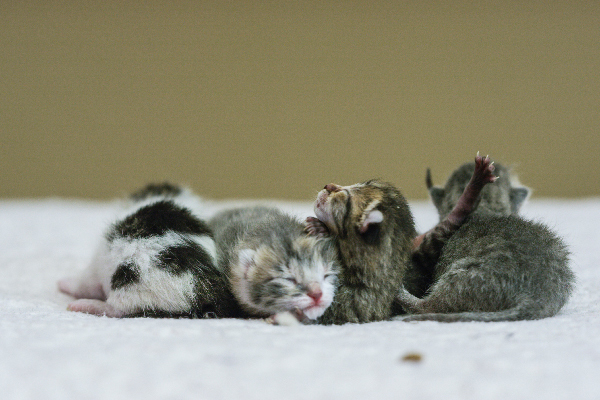 Each stage of newborn kitten care is different, so determining a kitten’s age is key to his survival. Zero to 7 days: Kitten weighs under 4 ounces. 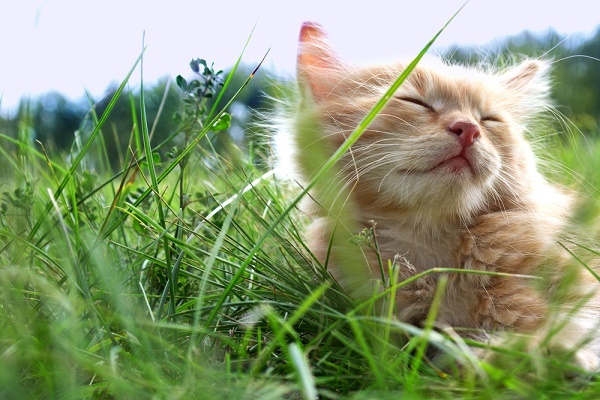 Eyes closed and ears flat. 1 week to 10 days: Kitten weighs 4 to 6 ounces. Eyes start opening, ears still flat. 2 weeks: Kitten weighs 6 to 8 ounces. Eyes opened, a bit of crawling, mostly sleeping and nursing. 3 weeks: Kitten weighs 8 to 12 ounces. Teeth begin to emerge and kittens begin to walk. 4 to 5 weeks: Kitten weighs 8 ounces to 1 pound. Kittens are on the move — they’ll begin using the litter box and eating solid food. 6 to 7 weeks: Kitten weighs 1 pound to 1 ½ pounds. Super playful. 8 weeks: Kitten weighs 1 ½ pounds to 2 pounds. Ready to take on the world — and your drapes! The reason it’s imperative for newborn kitten care to pinpoint a kitten’s age is because this information will determine what to feed him, how much to feed him and how often to feed him. 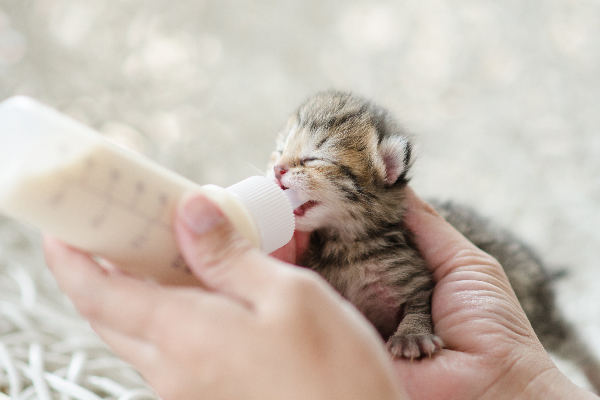 What to feed newborn kittens is important information, especially for folks who find themselves in an emergency rescue situation. Before getting into best feeding practices, it’s important to stress that keeping a kitten with his mother is the best type of newborn kitten care out there. However, if she is out of the picture, cow’s milk is not a suitable substitute. Newborn kittens can have goat’s milk (short-term) in a pinch until the proper kitten milk substitute can be procured. 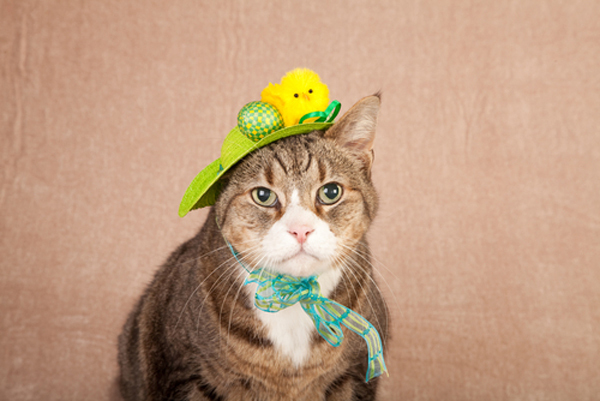 There’s also a recipe from The Feline Foundation of Greater Washington that can be used for 24 hours. Appropriate newborn kitten care starts with feeding the proper kitten milk replacer, which can be bought at pet supply stores, Amazon and Walmart. There is a proper way to bottle feed kittens. Photography ©anurakpong | iStock / Getty Images Plus. Make sure the kitten’s belly is facing downward. Check the liquid’s temperature before feeding (it should be warm, not hot and not cold — put a few drops on your wrist to test). Have warm, clean washcloths on hand — gently wipe his face after feeding. You’ll need one for helping him eliminate waste afterward, too. Keep kittens in a sizable dog crate for safety for the first few weeks — they need to have their temperatures regulated (heating pad in winter, cooling pack in summer, with enough space to get away from it). Nursing bottles need to be sterilized after each feeding. Kittens need to be burped during and after feeding – pat his back gently until he makes a little burp. Kittens require 8 milliliters of formula per ounce of body weight daily. Newborn kittens up to 1-week-old need to eat every two to three hours. Two- to 3-week-old kittens need to eat every four to six hours. At 4 weeks old, kittens begin to wean. 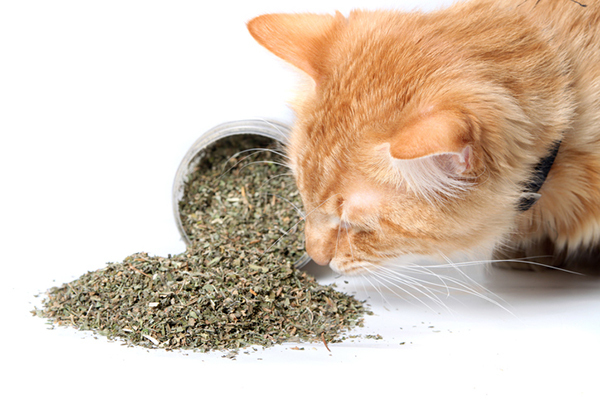 See Catster’s article on what to feed and when to feed weaning kittens. An important part of newborn kitten care is helping the newborn kittens eliminate. In addition to needing his temperature regulated, a neonatal kit requires frequent feedings (don’t forget the burping), and hands-on help eliminating waste. Take a warm washcloth and gently rub under his tail. This should stimulate him to pee and poo. He must do this after eating — it can happen quickly, but be patient, because it can also take a while. Then, with a fresh, warm washcloth, clean his hindquarters and dry them with a towel. If the kitten does not eliminate after eating and you’ve been very patient, he must go to the vet immediately. If you’ve found a kitten, take him to the veterinarian. After he’s gotten a clean bill of health, your knowledge of newborn kitten care will ensure he’s on the fast track to a healthy adulthood. 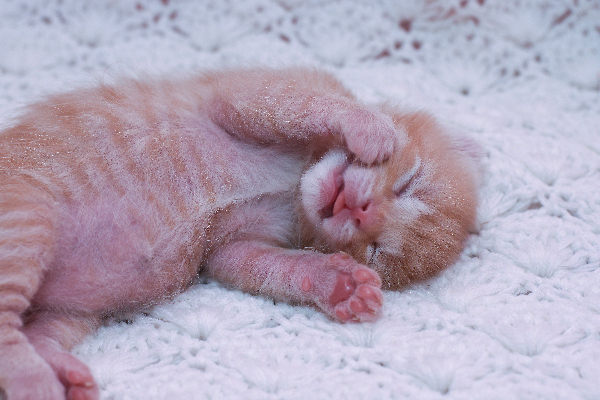 Tell us: What are your newborn kitten care tips? Thumbnail: Photography ©FatCamera | iStock / Getty Images Plus. I had to raise my dog Ginger babies from 9 or 10 days old. I had called our vet to find out what to feed them etc. I used a human baby bottle and I automatically knew how to hold them. The vet’s formula for the milk was the same as my 3 human babies except for one thing. For my babies I added a tablespoon of white Karo syrup to each batch of canned milk mixed with water 16 cups total. For the puppies, it was a tablespoon of castor oil to help them with the toilet duties. I used a warm wet paper towel for that and it worked great. One of the puppies actually wanted to lay on my arm like my kids did. The rest all lay on their tummies to be fed. It was quite an experience for me. We kept one of them and my husband named her Sparkle after the dog he had when we got married. That girl slept between our pillows every day of her life. Needless to say, we fell in love with her. The other 4 went to good homes. After the spay or neuter. I LOVE to be the Momma cat and have fostered many kittens from day old orphans to nearly too late to be tamed feral kittens. They had a mom…but within a week or so would have been on their own and breeding a few months later. They were tough cookies…but I won them over and all got good homes/ mom got spayed and released. I have had a few scares too…once a tiny kitten stopped breathing while eating and same kitten had a low blood sugar thing where she nearly died again. I would suggest keeping Karo syrup or honey on hand just in case. Just a small bit in her mouth on my finger, brought her around and she would have died had I not had some in the cupboard. I always cut up old soft dish towels into small squares and kept them beside me in a bowl of hot water, which gradually cooled down as I fed, to use on their butts & faces. I would just set aside the dirty ones as I went. Do the kitty burrito to keep kittens warm…they can’t generate their own heat and need to be kept warm! I found it best to set the kittens belly down on a little litter box hold up their little tail gently and use a warm cotton ball to stimulate evacuation. I used a warm cotton ball to clean and dry one to dry. I just threw threw the cotton balls away afterwards. No laundry.